The Maker's Mark Cask Strength release has been drawing my attention at the stores for a while now, but I just couldn't convince myself to purchase such a small bottle for $35. Maker's Mark produced this limited release bourbon in 375ml bottles, and it always seemed there was a full sized bottle of something else that I'd rather have. Eventually, though, I found myself heading to the store for the specific purpose of grabbing a bottle. I'm a fan of Maker's Mark to begin with. When I'm out and the selection is limited, it is usually my go-to bourbon. Accordingly, it should follow that I would enjoy the higher proof version. At 113.3 proof, the burn is significantly stronger than the standard Maker's Mark. That being said, it's one of the smoother higher proof bourbons I've had. This is a sweet bourbon, with grain/cereal flavor in the background, while flavors of vanilla and caramel take center stage. There is also a nuttiness to it, blending perfectly with all the other flavors. It absolutely has the flavor profile of Maker's Mark, but with much more complexity and robustness to it. The alcohol burn lingered slightly on the finish, along with a mild spiciness that complemented the up-front sweetness very well. This is also a thicker feeling bourbon than regular Maker's Mark, causing its flavors to linger much longer, providing that much more enjoyment. My only critique is that I only wish I could buy it in larger bottles (I'd buy it by the gallon!). That being said, there may be something to the notion that it allows the distiller to make a limited release more available to consumers. 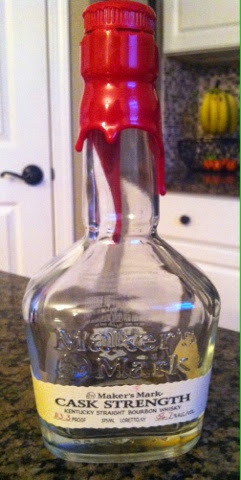 This bottle went way to quickly, though, which was a bummer because I really didn't want the bottle to end. Despite the small bottle and high price, I found this one to be worth every penny--an absolutely great bourbon!